The best way to describe Jak II: Renegade, Naughty Dog’s sequel to 2001 hit The Precursor Legacy, is something akin to a moody teenager. Players will immediately notice the game’s darker tone, a more aggressive protagonist and a structure borrowed from one of the most controversial gaming franchises ever to exist. And like a moody teenager, the game throws many tantrums that will leave the player feeling heartbroken. Sadly, seeing as Jak II isn’t your offspring, it’s certainly a lot harder to forgive the flaws present here. Jak, Daxter, the Green Sage Samos and Keira are testing out technology found at the end of Precursor Legacy. A dark portal opens up, with a super-saiyan rage monster threatening them, and a button push causes the group to blast full-throttle into the portal. 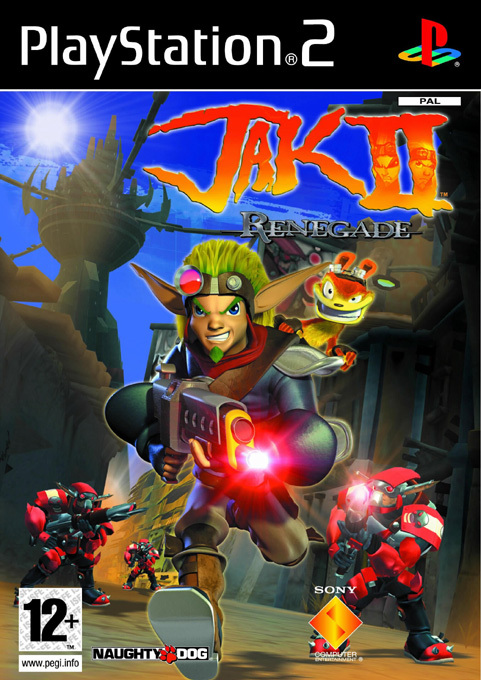 Separated and lost in an unknown city, Jak is captured by guards while Daxter flees. Two years pass, and Jak has undergone Dark Eco experiments performed by Lord Praxis. Daxter manages to break him free, and they escape the prison. Left to fend for themselves, Jak and Daxter must find out where they are and, to quote Jak, “kill Praxis”. The story is much darker this time around, with profanity, sexual jokes and edgy humour. While it may scare away younger players of the last game, most will find a much more satisfying story here, with more cutscenes, more characters and even more charm. Along with the innocent veneer, Naughty Dog voted to scrap the structural make-up of the previous game. No longer a platformer, Renegade instead opts for an open-world approach. As soon as you escape the Prison Jak is incarcerated in, a mini-map pops up and the world of Haven City is supposedly your oyster. As with most open-world games, an icon pops on your map directing you to a mission, and more missions unlock as you complete the ones before. Each mission opens with a cut-scene, a la Grand Theft Auto, and usually requires you to fulfil a favour for many of the game’s wacky characters. You can travel to each mission on-foot, by driving using found or hijacked vehicles, and once you unlock it by riding your hoverboard. Most missions take you outside the city into the game’s sub-levels, where you’ll tackle objectives such as finding lost artefacts, killing a certain enemy or destroying objects in the game. Considering Renegade still labels itself as a platformer, this structure is somewhat unique to the genre, albeit not so much in general. But that’s one of the problems with Renegade. The platforming has been put on the bench for a more combat-driven experience. Granted, it still has it’s moments, but the platforming is pretty much as it was in the last game. Jak can jump and double jump, as well as spin to extend his jump slightly. He can also do a barrel roll and jump for bigger distances. The camera does a good job of keeping up with Jak, meaning timing jumps is easy. The game also throws into the mix swing poles, moving platforms (some which incinerate) and other deadly pitfalls. One new, and frustrating, platforming element however is the hoverboard. Certain jumps require you to grind a rail in front, and this is frustratingly haphazard, seeing you either fall off mid-grind or not connect altogether. These portions of the game are incredibly taxing, and kill the pace. The other portion of Renegade is shooting. Replacing the eco-powers from The Precursor Legacy, you gain four weapons; the Scattergun, Blaster, Vulcan Fury and Peacemaker. Translated, this equates to a shotgun, a sniper rifle without a scope, a machine gun and, well, club which fires balls of electricity. Aside from the over-powered Peacemaker, most of the guns do the same amount of damage, which is pretty odd, but they’re effective in different scenarios. The Scattergun will deal with enemies quicker if they are close, and the Vulcan Fury is great for clusters of enemies. But, combat is mostly pretty shallow; with no aiming system and a breezy auto-target meaning you just face the enemies and shoot until they die. If an enemy goes off-screen, however, prepare for more frustration as none of your shots hit. And it’s a shame combat isn’t much fun, because most of the game consists of this. Perhaps the biggest problem with Renegade, however, is its completely balls-hard difficulty curve. Considering enemies can take off a whole quarter of your health in one hit, and there’s a sparse amount of healing cubes placed in each level, deaths are a frequent occurrence. This would not be so bad if it were not for the game’s god-awful checkpoint system which, more often than not, will put you straight back at the beginning of the level. All enemies will respawn, meaning you have to slog through all that again, and it can be an incredibly frustrating experience when you make your way through several gun fights, only to have to replay all of them again because one lucky sod got a shot at you. Missions that should take a few minutes instead take ten or twenty, and takes a lot of fun out of the experience. Renegade will take you about 15 to 20 hours to complete. Much of this may be totted up through frequent deaths however, and the sizable portions of the game you thus have to replay. Once you finish the game once, the motivation to replay and suffer through some of the more brutal missions, including one where you must kill 30 invisible enemies without dying lest you respawn all the way to the beginning, is non-existent. There are side missions, but these are usually just collection quests, vehicle races, or even just repeats of the game’s story missions. There are also hundreds of Precursor Orbs, which unlock special cheats, though usually the more interesting cheats require the most Orbs. Thankfully you keep Orbs found even after deaths, so finding them isn’t too bad if you’re that way inclined. Otherwise, you’ll move on from Jak II after completing the game once. At least Naughty Dog maintain their tradition of pushing hardware to the limit. Jak II looks stunning in so many ways, which makes it a harder pill to swallow that the gameplay isn’t up to snuff. The city of Haven is alive, with loads of civilians and guards, featuring a good level of detail and great animation, driving or walking through the city. The main characters look great, with expressive animation during cut-scenes really bringing the story to life. Perhaps one of the most technically impressive scenarios comes towards the end, as war breaks out between an evil race and the guards of the city. All this fighting is going on, as well as civilians fleeing, and yet the frame-rate never chops one bit. It’s a technical feat as well as a sight to see, so long as you can make it that far before snapping your controller. Renegade is pretty good on the ears too. 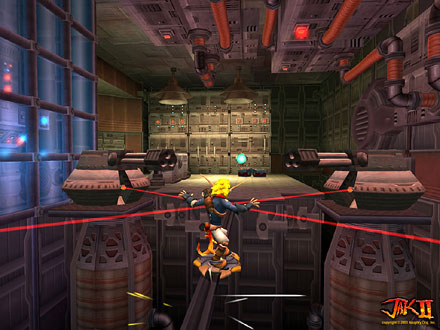 This is mainly in the voice-acting department, where many who performed in the previous game reprise their roles, and new characters such as Sig and Krew also impress as well as Jak himself, who’s sporting a different voice this time around. And he is, as a result, much more likable in that regard. Everything else is fairly standard, with music which doesn’t offend yet won’t exactly put you in a state of awe. 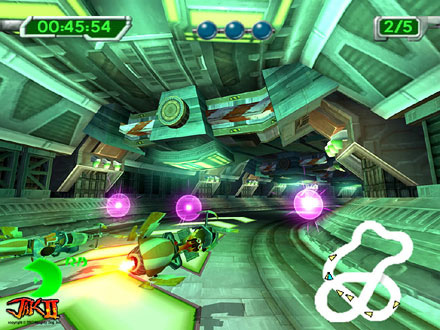 Many of the sound effects may be recycled from the previous game, though nevertheless help to create a sense of style and character for the series at least. 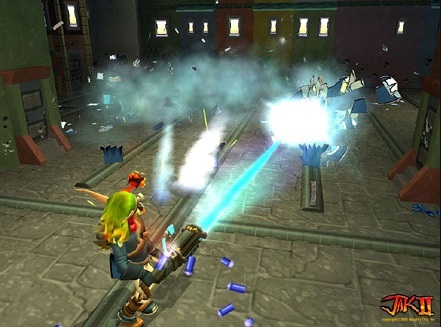 Jak II: Renegade will simultaneously impress and cause major frustrations. While a technological accomplishment, Naughty Dog doesn’t back up their visual pizazz with fun gameplay, and for every good mission comes three which cause you to snap your controller in half. If you can stomach some extremely challenging, bordering on unfair gameplay as well as shallow combat and a sad lack of platforming, then you may still be taken in by the game’s story and presentation, but everyone else will just breathe a sigh of relief when you’re finally free from this game’s barbaric difficulty curve.